Transumbilical minimally invasive surgery (TUMIS) involves performing laparoscopy through a single, small umbilical incision. The primary goal is to avoid visible scarring. There also may be potential for decreased postoperative pain with this approach. This study examines the early experience of an advanced minimally invasive program developing this technique using standard laparoscopic equipment. Data was retrospectively reviewed and analyzed on 15 patients undergoing TUMIS procedures (appendectomy and cholecystectomy) over a fourteen month period. For comparison, we reviewed the last 10 laparoscopic cholecystectomy and appendectomy patients done during this time period. The operations were performed by a single surgeon at a tertiary referral center using standard laparoscopic trocars and instruments. Over the last 14 months, 15 patients underwent TUMIS. These procedures included appendectomy (6) and cholecystectomy (9). In the appendectomy group, TUMIS patients as compared to those undergoing standard laparoscopy, were similar in age, gender and body mass index (BMI). The average operative times were not statistically different at 75 and 48.4 minutes (p-value=0.069) in the transumbilical and standard appendectomy groups respectively, Perforated appendicitis was present in 16.7% in the transumbilical group versus 20% in the standard group. There were no complications in the transumbilical appendectomy group, and there was one complication of intraabdominal bleeding in the standard laparoscopy appendectomy group. Length of stay was 1 day in the transumbilical appendectomy group as compared to 1.7 days in the standard laparoscopy group. When analyzing the cholecystectomy patients, demographics were similar in age and BMI, but the transumbilical group was 100% female as compared to 70% in the standard group. Operative times were not statistically different at 83.1 and 66.5 minutes respectively (p-value=0.13) for the transumbilical and standard groups respectively. In terms of presentation, 7/9 (77.7%) of patients in the transumbilical group presented with chronic cholecystitis, as compared to 1/10 (60%) of the standard group. The other two patients in the transumbilical group presented with choledocholithiasis and gallstone pancreatitis. In the standard group, the other patients presented with acute cholecystitis (30%), and biliary dyskinesia (10%). One of nine (11.1%) patients in the transumbilical group suffered from a complication (retained common bile duct stone). This patient had an initial diagnosis of chronic cholecystitis. In the standard group 1/10 (10%) of patients suffered from a complication (intraabdominal abscess). Conversion rate (to standard laparoscopic) was (1/9) 11.1% for the transumbilical group and 0% for the standard group. Length of stay was less than one day for both groups. The overall complication rate was 6.7% (1/15) in all TUMIS procedures. 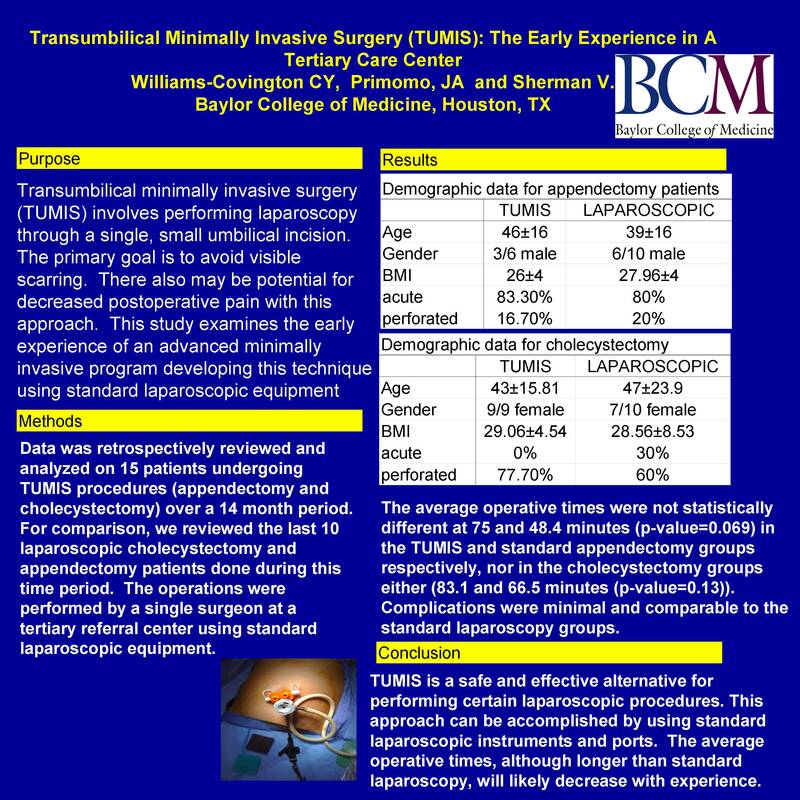 Early data demonstrates that TUMIS is a safe and effective alternative for performing certain laparoscopic procedures. This study demonstrates that this approach can be accomplished by using standard laparoscopic instruments and ports. The average operative times, although longer than standard laparoscopy, are not statistically different and will likely decrease as experience increases and new instrumentation is developed. In addition, this approach offers better cosmetic results, however, further studies must be performed to elicit whether a significant benefit exists.